Camp Namanu, nestled in the foothills of Mt Hood, has been a Northwest tradition for youth since 1924. A warm and inviting envi- ronment, Namanu inspires and encourages all who enter. Lifelong friendships are made, an appreciation of nature is developed, and new skills are learned. The opportunity for creative design in the border of this basic garter- stitch crescent-shaped shawl captures the feeling of excitement that Namanu campers and staff experience every day. 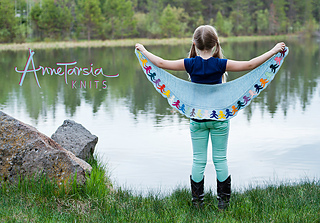 After I designed the original “paper doll” version, contributors devised their own motifs, which are included in “Annetarsia Knits: A New Link to Intarsia”. It just takes a little creativity to develop a unique motif, and the versatile design works with a wide variety of yarns, offering plenty of room for customization.